WazirX is an official Pundi X Exchange partner! You can unlock your Pundi X tokens for July if you’re holding it on WazirX because we support the monthly token airdrops! For those who don’t know: Pundi X unlocks 7.316% of the token balance for the NPXS holders every month! For example, if you’re holding 1 lakh NPXS, then you’ll get 7136 tokens. How do I claim NPXS tokens on WazirX? Anyone holding NPXS as on 8PM IST on 31st July 2018 on WazirX is eligible for the airdrop. Unconfirmed deposits will not be considered, so please ensure that your deposits are done before 7PM that day. We’ve already built a robust airdrop feature on our platform. 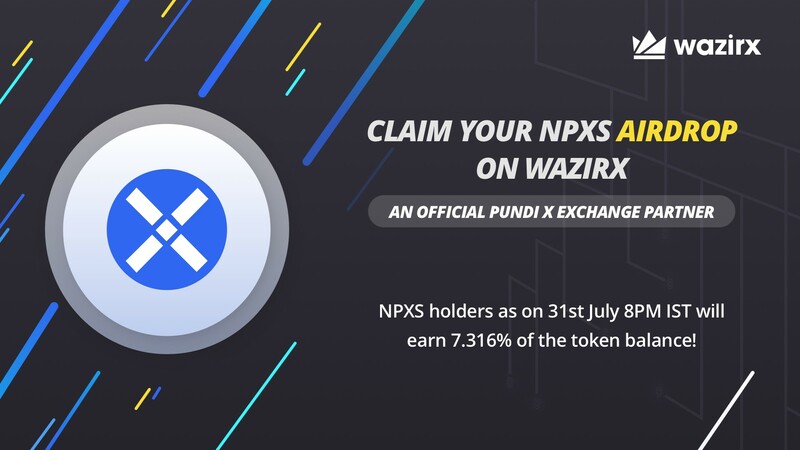 Your NPXS tokens will be credited to your WazirX wallet as soon as we receive it from the Pundi X team — in the first week of August. We’re building the world’s first automated P2P open order book! Your P2P transfer experience will be as seamless and open as trading crypto on the WazirX trading platform. Moreover, you’ll also be able to set your own price to ensure that your order gets executed faster! Priyanka works at WazirX. She’s HODLing like most of us. Building India’s most trusted cryptocurrency exchange.